This style comes with a removable footbed that changes a medium to a wide. Waterproof leather and seam-sealed construction lock-out moisture, keep you dry and comfortable no matter what Mother Nature dishes out. XC4® technology offers advanced cushioning and a customizable fit. Full-grain waterproof leather upper with seam-sealed construction. Advanced construction reduces overall weight, optimizes flexibility. Sheepskin lining with sheepskin/moisture-wicking removable performance insole for comfort and customized fit. 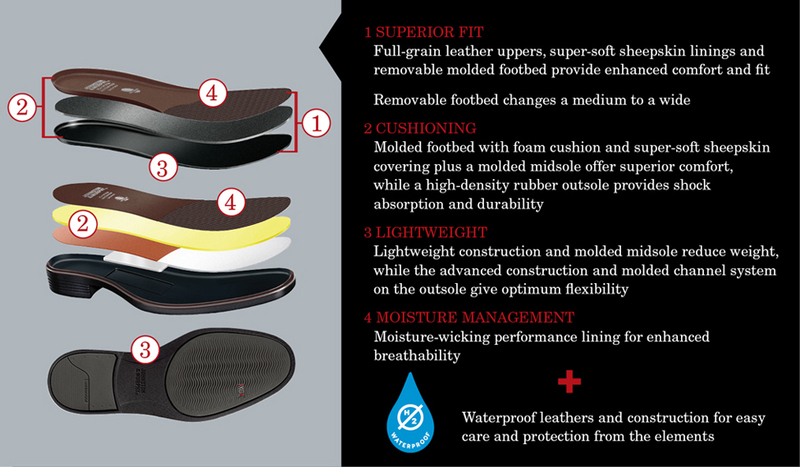 Molded footbed and midsole for support; memory-foam cushioned insole. High-density rubber sole for shock absorption and durability. Great looking boot. I ordered the Oak and the Brown. The Oak is more dressy which wasn't what I was looking for. The Brown is perfect for jeans and chinos which was my aim. Some reviewers complained that the boots ran large. I didn't find that to be the case at all. I have a slightly narrow foot (C width) so I am sensitive to length and width issues. I find the fit consistent with my other J&M shoes. Hopefully, they wear as long as my other J&Ms, as well. I have a number of shoes from different brand makers with varied degrees of success, but I can say these are one of the most comfortable boots I've ever owned. Despite daily use, the soles haven't yet worn out which is great. The sizing and mold is perfect for my foot and the leather is comfortable and soft. The only issue is that with daily use, these boots scuff up fairly quickly. You will likely want to learn how to clean and polish them to keep them looking good, but other than that no complaints. Can't take them off. No sign of wear after a year. Never thought I'd need the water proofing, living in drought stricken CA. However had an unexpected downpour just as small plane landed at commuter terminal. The Tarmac had 5 inches of water. I figured the boots were toast. My feet stayed dry and the shoes showed nothing! It was miraculous. Can only imagine how great they'd be in real winter! I bought a brown pair last year and wore them non stop, so comfortable. So, this year I have bought the brown and black pairs - They are just so comfortable and stylish, can be worn with jeans or smart casual work wear. And they don't need breaking in due to the soft leather. A really good looking boot that really is waterproof. I've had others that claimed to be so but were not! Also, a very good true to size fit. This is very well-made, comfortable and stylish boot. I was looking for boots like this for a while, and even splurged for a very expensive pair 2 years ago, but they were poorly made and not waterproof so I returned them. I first bought a pair in brown and loved them so much that I waited for a sale and snatched up a pair in black. They're perfect for the winter. I can wear them to work with slacks or a suit. I love hi-end shoes and never wore this brand before, but they might just be the most comfortable shoes I own. Foot Paradise! The only thing you should note is that they run 1/2 size large. Overall great shoe! This is a well made boot - great fit and I highly recommend it.